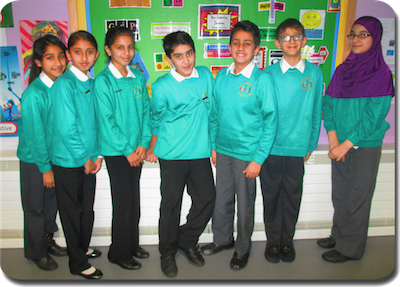 It is essential that ALL of our children wear their school uniform each day and look really smart. We all need to wear our uniform with pride and show that we are delighted to represent Horton Mill Community Primary School. Boys: School sweatshirt, white polo shirt, black or grey trousers. Girls: School sweatshirt, white polo shirt, grey pinafore or black / grey skirt or trousers. Shoes / Footwear: Children are required to wear sensible black shoes to school. There has been an increase in many children coming to school wearing a wide range of brightly coloured trainers. This is UNACCEPTABLE. Parents of children wearing shoes other than black will be contacted immediately and asked to bring in the required footwear. Parents of children without the correct uniform will also be contacted immediately and be asked to bring their child’s uniform to school. School jumpers: These can be purchased from Mrs Guilfoyle or Mrs Jagger in our office at a cost of £8.00. Other accompanying items such as polo shirts, trousers, etc, can be purchased relatively cheaply from a wide range of supermarkets. PE kits: White T-shirt and black shorts or tracksuit top / bottoms or leggings. Children must change into their PE kit for PE and then back into their school uniform afterwards for hygiene purposes. Children may be required to wear pumps for inside activities and trainers for outdoor activities. It is really important that children bring their kits on the correct days. Birthdays: Children are able to wear their own special clothes to celebrate their birthday. We thank all parents / carers for their anticipated co-operation.